As with learning any topic, students usually learn a tremendous amount of information about a topic for the first while, then they reach a certain level of competency and halt all learning. The same is true with photographers when we get a new camera. When we first get our hands on a camera, we spend every waking second learning how to use it and all the buttons and dials. Then… we suddenly stop. But if you stop learning your camera too soon, you miss out on some REALLY COOL features in most–but not all–DSLR cameras. This post will hopefully enlighten you on a few features that are commonly (but not always) put in DSLR cameras that most photographers don't know they have. Oh, and my favorite thing about writing this post is that I just CAN'T WAIT to read the comments. There are always a few “know it alls” who have to share with me the fact that they “knew that stuff already.” I get a lot of pleasure out of those comments for some reason… but I hope everyone finds at least one thing in this list that is new. First, some background. Picture Controls (that's Nikon's name for it) or Picture Styles (for the Canonistas) are applied to every picture you take. The RAW photo coming off the sensor lacks contrast, sharpness, and color saturation. In fact, it's downright ugly. Your camera applies these adjustments to each picture to pretty it up for you. I have never worried myself with setting the Picture Control because I ALWAYS shoot in RAW. However, I was out shooting with Dustin Olsen a few months back and looked at the back of his camera to see how the photos were coming out. WOW! It was so much more beautiful than my LCD screen! Dustin sets a custom picture control so that the photos on the LCD screen look more like how they will look in post-processing. This helps him to visualize the finished photo. Changing the picture control if you shoot in RAW will not affect the image you see on the computer, but it will help you see what you're capturing on the camera. To set a custom picture control or picture style, go to your menu and find the custom picture control setting. 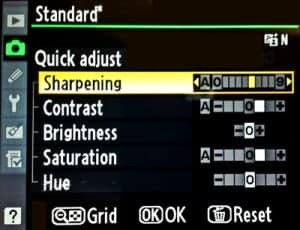 I like to use these settings: If you shoot in RAW instead of JPEG, this is still true because your camera saves out a JPEG preview that is used as the thumbnail image and to display on the LCD screen on the back of your camera. Multiple exposure can be pretty fun for creative effects, and it is an oft-overlooked feature on many DSLRs (not all of them have this). Multiple exposure means the camera takes 2 or 3 (or more) photos in a row and then combines them to create one picture. For example, you might shoot a runner sprinting down the track. For a creative effect, you could set your camera to multiple exposure and lock it down on a tripod. Then take three pictures of the runner sprinting by and the camera will combine them into an action sequence. You can get the multiple exposure effect in Photoshop too. Sorry Canon shooters, your DSLR most likely won't have this feature; however, most Nikon cameras come with this feature. A time lapse is when your camera is set to take a picture every second or so. Then, the individual frames (usually taken over the course of 30 minutes or more) are combined to create a video like this one. On a Nikon DSLR, you can find this feature on the menu called “Interval timer shooting.” I wrote out a tutorial here of how to do timelapse on both Nikon and Canon cameras. Nothing is more annoying when shooting than when the screen constantly turns off while you're reviewing images on the LCD screen. I like to take a nice long look at the photos and zoom in on different parts. I like to work methodically most of the time, and especially when shooting landscapes. All DSLRs allow the photographer to adjust how long a photo is displayed before the screen goes to sleep. I like to set this to about 10 seconds. If you are short on battery life, this probably isn't a great idea, but I always have fresh batteries lying around and use a battery grip, so I don't really worry about battery life nearly as much as I worry about being able to get a good long look at the photos I'm working with. Lately, I've been experimenting in working with an iPad so when I shoot a photo, it shows up almost immediately on my iPad (wirelessly) so I can see the photos full screen. I have a step-by-step tutorial on wirelessly connecting your iPad to your DSLR here. I love it for landscapes where I'm working slowly and really checking each picture, but it's probably impractical for shooting portraits, sports, wildlife, or other fast-moving subjects. No, not exposure compensation. Exposure compensation is when the photographer tells the camera to decide the correct exposure, and then get either brighter or darker depending on what exposure compensation setting the photographer set the camera to. Flash compensation works similarly. The camera will determine how much flash output is needed, and then the photographer can set the camera to either give more or less power to the flash according to the look that the photographer is attempting to achieve. When might you use such a thing? I thought you'd ask. If you're using an all-manual flash like the YN-560 (see my YN-560 review here), then this is entirely irrelevant. This is also mostly irrelevant if you are using an eTTL or iTTL flash because those flashes allow the photographer to change the flash compensation from the flash's menu so you don't have to go through the camera menu. The use-case for this is when you're in a pinch and are forced to use that blasted pop-up flash. Photographers hate using the pop-up flash because it looks ridiculously ugly since the light is coming from the same angle as the camera and therefore not directional. 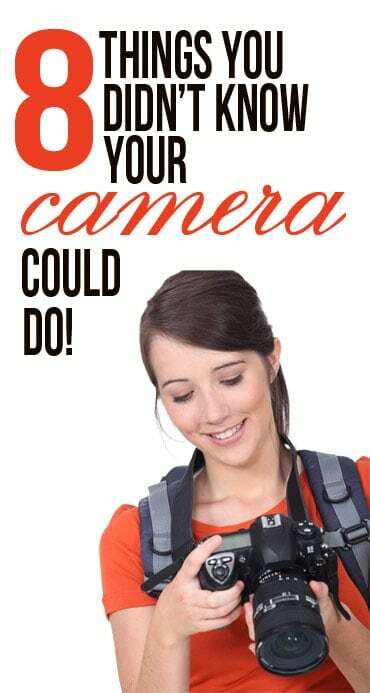 However, if you use flash compensation, you can control how much flash is used and achieve much better pictures when you're in a pinch and you need to use flash (like when Aunt Janet hands you her point-and-shoot to take a picture at the wedding). This feature is somewhat better known among photographers, but still the kind of thing that a lot of photographers don't notice until they have shot for years. Most DSLR cameras have a small black button on the front of the camera just to the left (camera left) of the lens. If you look through the viewfinder and press the button, it will make the screen go a bit darker, but it will also show you how the depth-of-field will look when you take the picture. The button is useful because, contrary to popular belief, changing the aperture setting on your camera does not immediately adjust the aperture in the lens. The aperture snaps into place only right before the picture is taken. This is done so the camera can gather as much light as possible for focusing before the picture is taken. So when you're looking through the viewfinder, you already know what the depth of field will look like. Don't worry about the fact that the viewfinder will be darker–this is just because the closed aperture reduces the amount of light going through. Newer model Canon and Nikon DSLR cameras have begun to include “Instagram mode,” but it currently requires two tablespoons of butter to activate. All you have to do is smear the butter over the front element of your lens and viola! You have that “beautiful” look that only Instagram can offer. Sorry for those of you who aren't geeky and don't understand nerd humor. Instagram is a smartphone app for photography that puts some really overdone effects on photos so everyone can call themselves artists (okay, fine… it's fun). I get SOOO MANY questions about back button focus that I decided this one deserves its own post. Learn about back button focusing here. Using back button focusing can help get your focus more precise and faster.